A podcast about all things Macintosh. For Mac geeks, by Mac geeks. Show 239. As the App Store Turns. Apple updates Java. iTunes rocks unsigned artists. Would Apple shutter iTunes with royalty hikes? Macbook and Macbook Pro rumors linger. New iPhone software on the horizon. Apple stock takes a dive and rebounds. Immutable flag prevents changes. External hard drive and freeing up space at Home. Some simple Mac security. Is it time to finally move to Intel? Eject before disconnect? Living dangerously. A podcast about all things Macintosh. For Mac geeks, by Mac geeks. Show 238. Apple’s stock options backdating black eye healed? Maybe. Strong rumors of new Macbooks soon. Secrets found inside 2nd gen Touch. iPhone 2.1 seems to be delivering. Mac OS 10.5.5 update. Apple claims more home notebook share. Bill and Jerry break up the act. Quicktime exploit and iPhone trojan found. Apple recalls iPhone 3G wall adapters. Customize Address Book fields. Backing up your Keychain to the cloud. Cycle through windows within an application. Use iTunes outside your own country? Apple’s watching you. 2nd Gen iPod Touch review. Does new iPhone software reduce GSM noise? Some iTunes 8 extra features. Software and ideas for maintaining your Mac. Circus Ponies – The Easy Way to Get Organized on the Mac. Try it FREE for 30 Days. iTunes 8: Advanced Options Missing? Frequent emailer to the Maccast Robert noticed a little something in the recent iTunes 8 update. Something that has become a very common and un-Apple like annoyance in iTunes updates. For some unknown reason Apple re-designs or moves significant functionality between versions of the software. With iTunes 7 the one that got me was them moving the “chapter” options for enhanced podcasts to the menubar. In iTunes 8 the most confusing example is their removal of the 3 tab options (General, Importing, Burning) from under the ‘Advanced’ menu in the iTunes preferences. 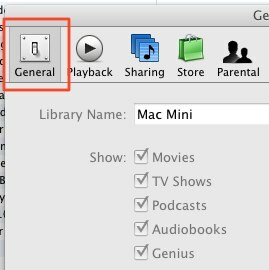 iTunes 8 simply has one ‘tab’ of Advanced options. The other two former ‘tabs’ have mysteriously vanished. Or have they? The import and burning options have actually been moved to other locations. In case you find yourself searching for these options, like I have been over the past few days, here is a quick overview of the process for setting these options in the latest version of iTunes. In iTunes 8, choose ‘Preferences’ from the ‘iTunes’ menu (Command + , ). In the ‘General’ tab, press the ‘Import Settings…’ button. 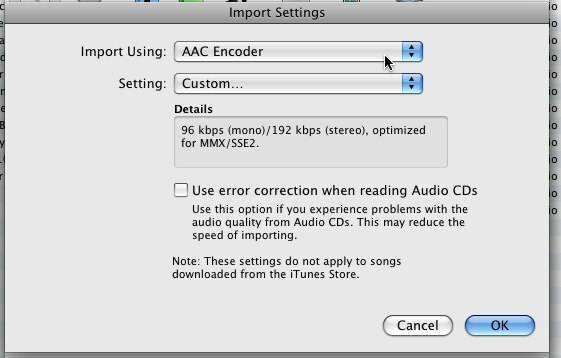 In the dialog box set up your desired import format, bit rate, etc. and click ‘OK’ when finished. In iTunes 8 create a playlist. If you want to burn a whole album you can drag the album from the new ‘grid’ view over to the playlist section in the left sidebar. This will create a new “playlist” for that album. Now select the playlist you want to burn. In the lower right corner of the main iTunes window click the ‘Burn Disc’ button. 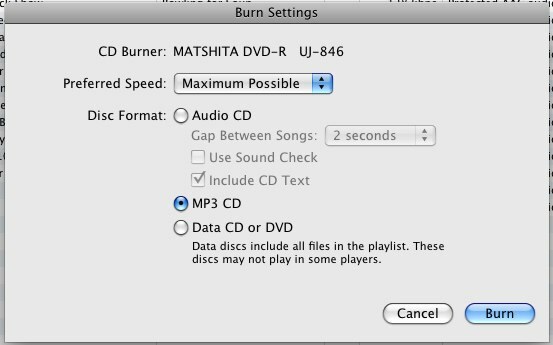 Now in the dialog box set up your desired disc burning options. You can choose the burning device and speed, select the disc format, set the gap between tracks, etc. Then insert a blank disc and click ‘Burn’. I am not sure why Apple chooses to move major functionality between versions like this. I personally find it annoying, but at least now you know what has changed this time around. A quick video unboxing the new iPod nano. A podcast about all things Macintosh. For Mac geeks, by Mac geeks. Show 237. Wrap-up of Apple’s “Ready to Rock” event. New iPod Classic. New iPod Nanos. New earbuds. New iPod Touch. New iPod Shuffle colors. iTunes 8. iPhone/iPod Touch 2.1 software update. iPhone Security Flaw Confirmed. Fix coming. First Vista Seinfeld ad airs. Apple finally acknowledges father of the media player. Can Pystar win against Apple? Non-apple iPhone apps don’t launch, what’s up? The 9:41 vs. 9:42 iPhone discrepancy. Use Mail “Stationary” to spruce up emails. Reset iPod warnings Review: Koi Pond for iPhone/iPod Touch. Mac making unusual chimes at start up. Speeds on the Macs USB buses. External drives, bus powered or not? Join us for Live Maccast chat open right now and going through the end of Apple’s live “Let’s Rock” event today (9/9). The Apple event begins at 10:00 AM PST. Join us on iChat/AIM in the room: maccast. 2) Go to: File–>Go to Chat… and enter “maccast” as the chat name.